THE Australia Indonesia Association of NSW has announced the nine finalists for its second annual Australia Indonesia Awards which recognise and honour Australians and Indonesians who have made significant contributions to the greater understanding and friendship between Indonesians and Australians. 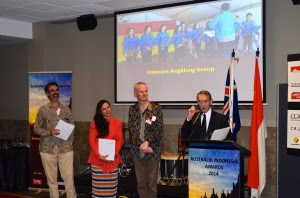 "The concept of the Australia Indonesia Awards program was inspired by the Australian of the Year awards, in that they recognize ordinary Australians (our awards also include Indonesians) who are doing extraordinary things in various fields of activity," Mr Eric de Haas, President of AIANSW said. "Politicians from both sides of politics have spoken of the underlying strength of the relations between Australia and Indonesia as being the 'people to people' relations. People nominated for the Australia Indonesia Awards are an integral part of these 'people to people' relations." In the inaugural awards in 2014, nominations were called for in three categories: Art, Education, and Media. For the second edition of the Awards, nominations were called for the categories of Business, Humanitarian, and Community involvement. Nominations closed in October 2015, and have been reviewed by an independent Selection Panel, chaired by Mr Bill Farmer AO, a former Ambassador to Indonesia. The Panel have selected the three finalists in each category, and will announce the winners in each category at the Awards Presentation Night to be held in Sydney on Saturday 12 March 2016. Bede Moore co-founded Lazada Indonesia, which is now the largest eCommerce company in the country. With his wife he has since founded their own company, Paraplou Group, managing to boot-strap a successful start-up, build a team of 60 people and raise $1.7 million in one of the biggest tech deals in Indonesia last year. Bede was also a founder of the Conference of Australian and Indonesian Youth for which he has raised more than $250,000 to enable 90 young leaders to travel to Canberra (2013), Jakarta (2014) and Darwin (2015). In 1996 Penny Robertson established the Australian International School – Indonesia with an emphasis on delivering a curriculum which incorporated children with disabilities into mainstream classes. AIS remains the only genuine international school in Indonesia which readily accepts students with disabilities and it has become a focus school for the Indonesian national education department to demonstrate main-streaming principles and practices to their officials and key teachers. Meiya Sutisno is a leading Australian and Indonesian Forensic anatomist who has set up a small and successful company supplying forensic services to both the public and private sectors in Australia and Indonesia. The services she provides include providing expert evidence to the legal profession on facial recognition and to the Governments of Australia and Indonesia. She also provides training services to those governments and to students at various institutions. In 2007 after he retired, Peter Johnston started providing funds from his own savings for no-interest micro loans to people in Bukittinggi, West Sumatra. He then linked with professionals in Western Australia to form an approved not-for profit agency, Bamboo Microcredit Inc, which promotes the idea of Australians donating money to assist Indonesian people on low incomes to develop small businesses. It is based on the premise of giving a hand up rather, than a hand out. Dr Jeanne Rini Poespoprodjo, an Indonesian citizen, has spent the last 10 years researching and implementing malaria treatments in Papua, one of the poorest and most remote provinces in Indonesia where maternal and infant mortality remains alarmingly high. In 2008, she was awarded one of the inaugural Allison Sudradjat Scholarships by AusAID (DFAT) to outstanding scholars and leaders in the Asia-Pacific region. In 2009 Brett South created Qantas Helping Hands Community, a small group of Indonesians and Australians working in the tourism industry. He was introduced to Indonesian communities that were mostly hidden from the wider community yet headed by determined individuals ensuring the children and young people in their care got a decent chance at life. Projects have included building of schools in Central Sulawesi, working with orphanages in Jakarta, and with Kampung Sawah (trash scavenging community). Emma Larssen, a member of the Cronulla Surf Life Saving Club in Sydney, moved to Bali as an Australian Youth Ambassador for Development to work with the Indonesia Surf Life Saving Association. She has been a key trainer and assessor in First Aid and lifeguard training of over 1,000 lifeguards, staff, water park employees and search and rescue employees across Indonesia. In 1974 George Quinn co-founded the Salatiga Program, an initiator of intensive in-country Indonesian language study for Australians. His textbook The Indonesian Way is used on-line for the study of elementary Indonesian across the world. He has also been an innovator in Javanese Studies in Australia and is founding ACT branch Chair of Balai Bahasa Indonesia. In 2015 Asosiasi Pengajar Bahasa Indonesia Bagi Penutur Asing awarded him the Satya Abdi Budaya for services to the teaching of Indonesian. The late Jane Taylor was a teacher of Indonesian in Victoria who established an outstanding VCE program at Bendigo Senior Secondary College and Catholic College Bendigo and strong links with a sister school, SMADA, in Makassar, South Sulawesi. She also worked with the Victorian Curriculum & Assessment Authority for over 10 years in the setting, assessing and assessment management of the VCE Indonesian Second Language Examination.